Childhelp Heart of an Angel awardee Ivy Ciolli walks her children down the runway. 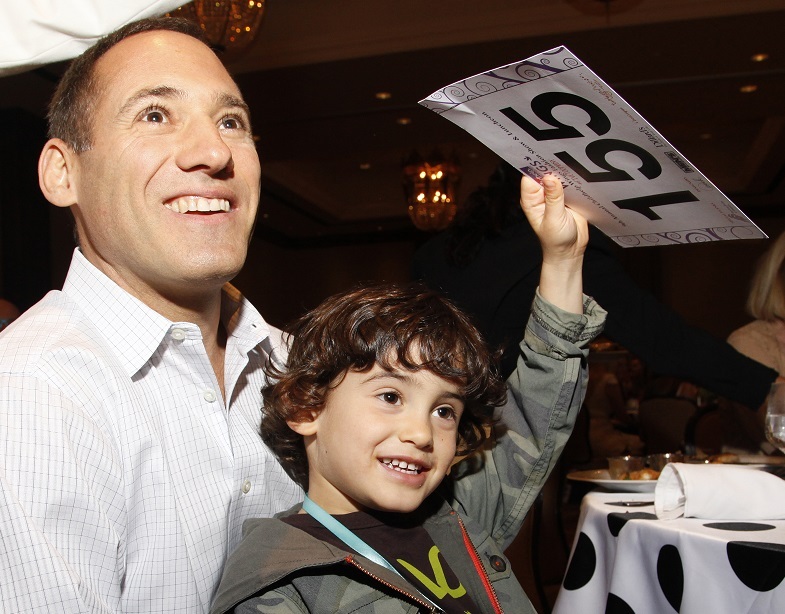 Joey Ciolli of Grimaldi's Pizza lets son, 5, bid on Baxter Birthday Party. Daughter of Childhelp Board Member Scott Schirmer, bids against Joey Ciolli's son. PHOENIX (Feb. 25, 2015) – Childhelp®, the nation’s oldest and largest nonprofit advocating for abused and neglected children, held its 9th Annual Childhelp Wings Fashion Show. The event was presented by Services Group of America and held on Feb. 22 at the Omni Montelucia Resort in Scottsdale, Ariz.
Childhelp Wings is organized to educate youth about issues surrounding child abuse and neglect, to instill the importance of giving back to their community and to enhance the relationship of families through the organization of events to aid abused children. This year’s theme of “#FiveTooMany” drew attention to the shocking statistic that every day in the U.S., five children die from child abuse or neglect. With 320 guests in attendance, the Childhelp Wings Fashion Show was chaired by Betsy Coffeen and Carey Pauley. Zendaya of Disney Channel’s Shake It Up! and K.C. Undercover, as well as Dancing with the Stars, co-hosted the event with ABC 15’s Nick Ciletti. The event was kicked off by Zendaya and Ciletti welcoming guests. The invocation was given by Childhelp’s Founding Mother Carol Hebets, who also co-chaired this year’s Childhelp Drive the Dream Gala, Childhelp’s largest fundraiser of the year. 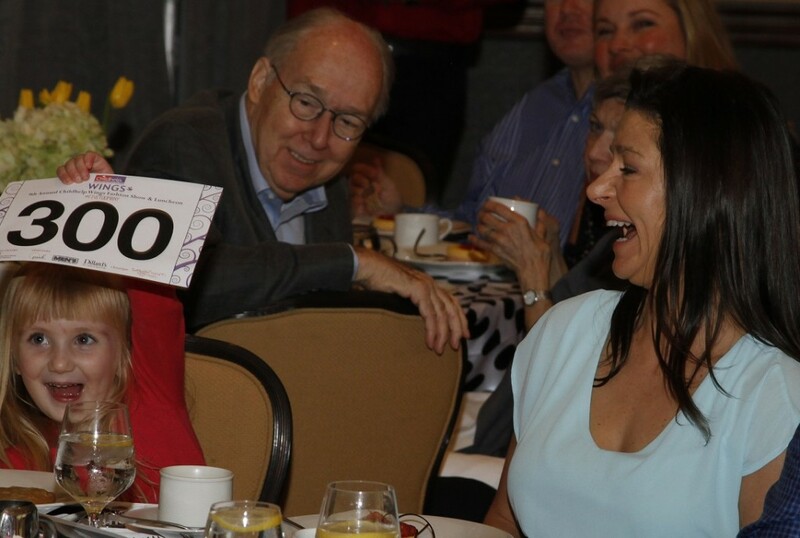 In addition to the fashion show featuring designer fashions by Dillard’s, i boutique, TwirlyGirl, Peek Kids, and Scottsdale Men’s Shoppe, the live auction called by auctiontainer Leticia Frye, raised funds for the organization. Lunch with Zendaya brought the highest bids of the day totaling $6,800. Two of Childhelp’s youngest supporters, three and five-years old, put their hats in the ring bidding against each other for the “Birthday Party with Baxter” package. The three-year old had the winning bid of $4,600. During the event, Childhelp honored Ivy and Joey Ciolli with the Childhelp Heart of an Angel Award. The Childhelp Heart of an Angel Award is given to an individual or individuals who commit to serving abused and neglected children through fundraising efforts and community activism. In our nation, a report of child abuse is made every 10 seconds and nearly 3.3 million reports of child abuse are made annually. Childhelp’s programs work to combat these issues daily. The proceeds from the Childhelp Wings Fashion Show benefit the Arizona programs and services of Childhelp such as the Childhelp Community Center of Arizona, Downtown Phoenix Childhelp Children’s Advocacy Center, and Childhelp Mobile Advocacy Center of Northern Arizona. For additional information please contact Teri Morris at Zion & Zion at (480) 751-1007, Ext. 131. Since 1959, Childhelp® has brought the light of hope and healing into the lives of countless children as a leading national nonprofit organization dedicated to helping at-risk children. Childhelp’s programs and services include residential treatment services, children’s advocacy centers, therapeutic foster care, group homes and child abuse prevention, education and training. Childhelp created the Childhelp National Day of Hope®, held each April during National Child Abuse Prevention Month that mobilizes Americans to join the fight against child abuse. For more information, log on to www.childhelp.org or facebook.com/childhelp.